Hidden within the confines of Horseshoe Canyon, vestiges of an ancient people from 7,000 years ago repose on the canyon wall. The figures, as large as 7 feet tall, tantalize historians today with the mystery of their purpose and meaning, defining an entire style of indigenous American rock art. The Great Gallery itself consists of a ~200-300 foot stretch of a rock wall on the side of Horseshoe Canyon in Canyonlands National Park in southeastern Utah. It features approximately 80 figures created with a red ocher-tinted paint. 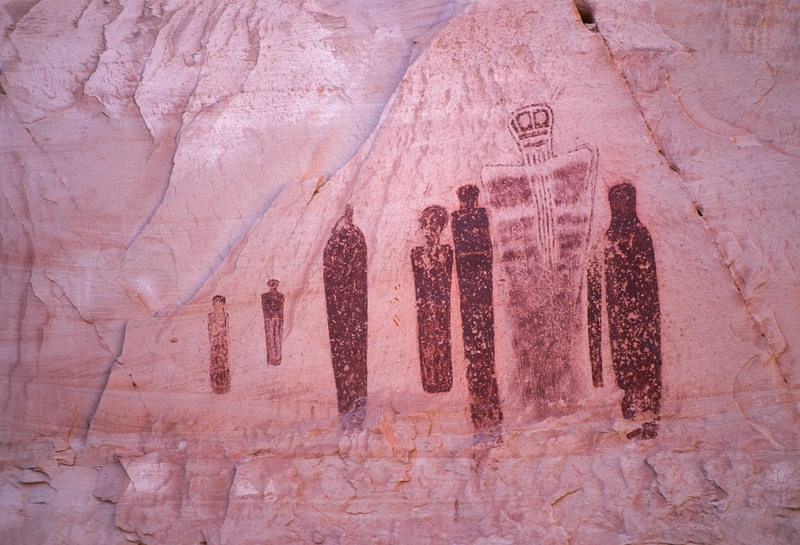 The pictographs and petroglyphs have been attributed to the Archaic people, a civilization that lived in Horseshoe Canyon over 7,000 years ago. These pictographs are similar to a variety of other rock art found in the Four Corners region but their influence and prominence in studies as well as the multitude of similar artwork in the canyon led Polly Schaafsma in the 1970s to name this entire strain of rock art the Barrier Canyon Style (as Horseshoe Canyon was previously named). Due to the ancient nature of the rock art, no single interpretation of the Great Gallery is guaranteed to be true. Many ethnographers have suggested that these murals were created for a variety of purposes such as hunting rituals, illustrating myths and traditions, recreation, or shamanistic magic. As for what the symbols themselves mean, the majority of the tall angular figures without appendages are thought to represent people. Some of the larger, more decorative figures are understood to be shamans. Their special decorative heads represent either the headdresses the shamans wore or the spiritual power these shamans possessed. Other figures included are those of animals or plants important to the Archaic people. Evidence of the Archaic people has been found in Utah dating back to 6,500 BC. They were a hunter-gatherer culture that migrated throughout the desert climate of the Colorado Plateau. This culture’s most recognizable and distinctive features include their rock art, twig figurines similar to the figures seen in the Great Gallery, and the baskets they wove. They used a spear thrower called an atlatl in order to hunt down their food and grinding stones to crush seeds to eat, allowing for a varied diet. As stated before, the Great Gallery is a particularly important selection of Barrier Canyon Style rock art. 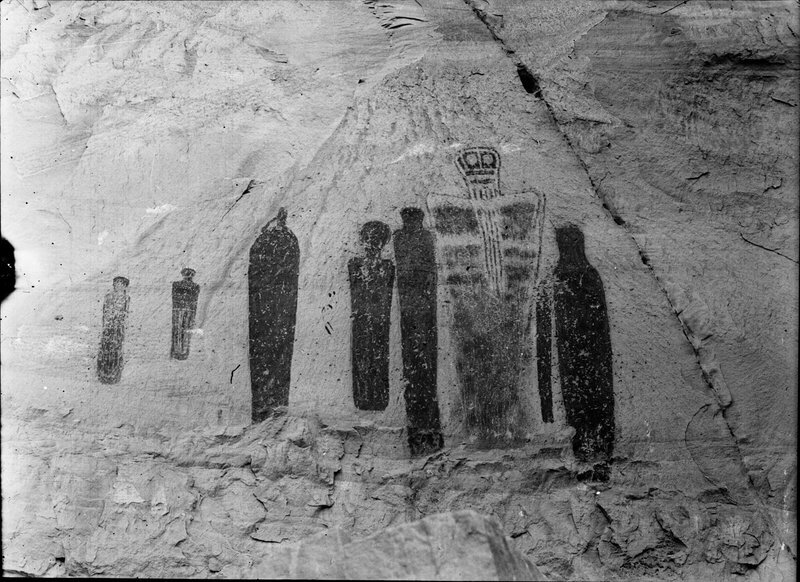 In fact, the Great Gallery pictographs were deemed so important, that a faithful replica was commissioned in the 1940s under Franklin D. Roosevelt’s New Deal program the Works Progress Administration. The mural, created by prominent Utah artist Lynn Fausett, was originally placed in the Museum of Modern Art in New York City before being moved to Denver during WWII for safe keeping and then traveling around the country until it finally settled at the Utah Museum of Natural History in 1969. A variety of methods have been used to date the art including radiocarbon dating and superposition, but these often do not help form a consensus. For instance, in 2014, a team of scientists led by geologist Joel Pederson used a method of rock dating called optically stimulated luminescence (OSL) used damage from a rock slide to determine that this section of the Great Gallery must have been created between 900 and 2,000 years ago. Other scientists maintain that radiocarbon dating of other artifacts in the area that look almost exactly like those in the pictographs support a much earlier dating. Time will reveal the answers to these mysteries as we understand more about the Great Gallery. 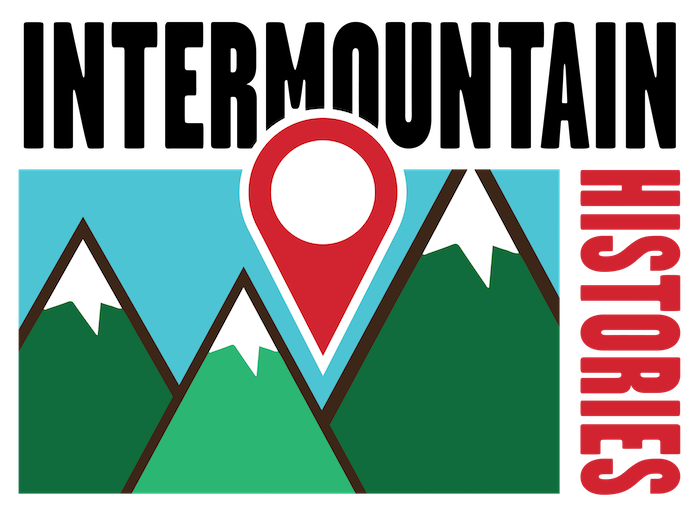 Brandon Sheeder, Brigham Young University, “The Great Gallery: Defining Barrier Canyon Rock Art,” Intermountain Histories, accessed April 19, 2019, https://www.intermountainhistories.org/items/show/97. Schaafsma, Polly. 1980. Indian Rock Art of the Southwest. 1st ed. ed. School of American Research ; Albuquerque : University of New Mexico Press, Santa Fe. Schroedl, Alan R.. “The Power and the Glory,” Canyon Legacy, Spring 1989. Mozdy, Michael. Natural History Museum of Utah Blog, “NHMU's Barrier Canyon Mural” October 2016. 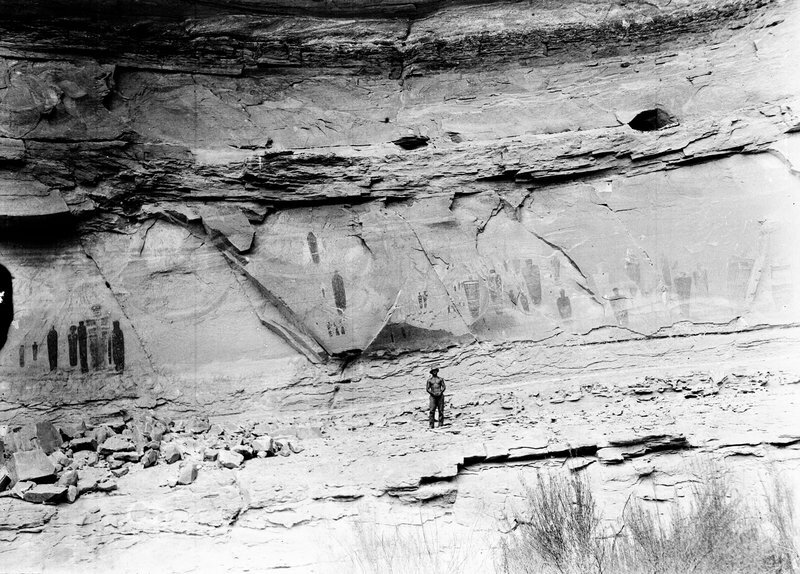 Tipps, Betsy L. Barrier Canyon Rock Art Dating (National Park Service, 1994). Pederson, Joel L., et al. 2014. "Age of Barrier Canyon-Style Rock Art Constrained by Cross-Cutting Relations and Luminescence Dating Techniques." Proceedings of the National Academy of Sciences of the United States of America, 12986-NaN. 2014. Repanshek, Kurt. “Traces of a Lost People.” Smithsonian Magazine. (March 2005).